I came across Theodore Gray back in the early days of the internet. I was writing about chemistry and he offered some of the first good pictures of the elements. Eventually, he collected more elements photos, compiling a well-known and respected photographic periodic table of the elements. 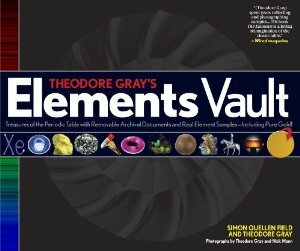 As an online personality, I tend to read e-books rather than ‘real’ books, so in the usual course of things, I would not have seen Elements Vault. However, my son brought it home for me to look at, claiming it was one of the best books he had ever purchased. If you’ve ever read any of my chemistry book reviews, you know I try to say nice things about every book I review, but I’m also critical, rarely finding a book I truly enjoy. I’m happy to say, I only have good things to say about this book. The only possible drawback is that it costs a bit more than other books of element facts, however, it’s a large hardbound coffee-table book with lots of extras, so (in my opinion) it’s worth it. if you are a hands-on type of person, this is the one book that can give you, literally, a feel for the chemical elements. You can find it online and at most bookstores. If you pick it up used, be sure the elements, documents, and poster are all still intact. They greatly add to the value of the book.